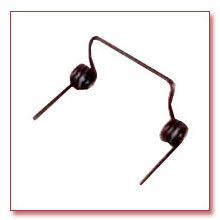 Our organization is counted amongst the most distinguished manufacturers and supplier of conical & taper springs. these products are manufactured using finest quality anneal steel and coated that makes our range rust free. Our range of products is appreciated for their special feature of being folded into themselves. These springs have there one end that is wide and the other that is thin. Our valuable clients can customize these products as per their needs and demands.